(CNN) -- Newcastle United have suspended former England international Joey Barton "until further notice" -- the Premier League club relegation candidates confirmed on Tuesday. Barton has been suspended by Newcastle following reports of a dressing-room bust-up with his manager. The move follows newspaper reports that the former Manchester City midfielder was involved in a bust-up with manager Alan Shearer following the 3-0 weekend defeat at Liverpool. Barton was sent off for a reckless challenge on Xabi Alonso that will rule him out of Newcastle's final three matches of a season. Shearer was reportedly fuming in the dressing room after the match and the club ban follows Barton's reaction to his manager's criticism. "Newcastle United can confirm that Joey Barton has been suspended from the club until further notice," read a terse Web site statement. "The club will be making no further comment on the matter at this time." Shearer took charge in a bid to save his former club from relegation, but they are currently three points adrift in the drop zone with matches to come against Middlesbrough, Fulham and Aston Villa. 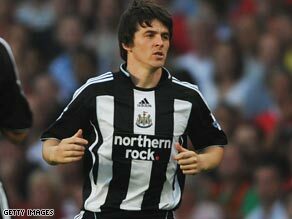 Barton, 26, joined Newcastle two years ago on a five-year contract for £5.8 million and his agent Willie McKay says he has no plans to leave the club. "It's ridiculous for people to claim Joey Barton has played his last-ever game for Newcastle United, beacuse he has three years left on his contract ... and he wants to honor that commitment," McKay told media. But he admitted that "it's the club's perogative as to whether or not they decide they want to sell Joey" in the wake of the latest development in Barton's controversial career.